VR-301 - 45 day duration floor-standing Vienna Regulator in an Elegant Case. The Altdeutsche period produced an amazingly broad range of case styles, all exemplified by the Roman columns topped by carved Corinthian capitals with acanthus leaves. This clock, with its full columns to both the door and the base, epitomizes the more elegant, almost Edwardian aspects of the Altdeutsche period. The case, resting on four large bun feet, is in exquisite condition with the patina only found on clocks that have been well cared for all of their lives. 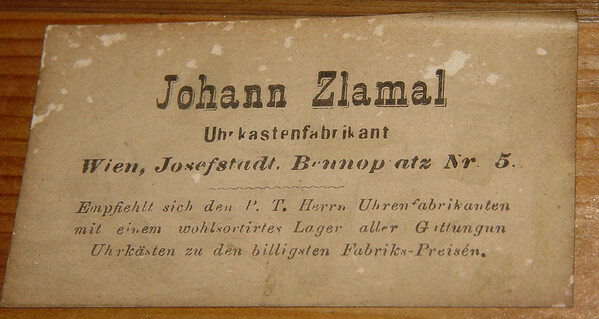 Note the full columns so often found on quality Viennese-made cases - unlike the half or quarter columns found on the more common German cases. This case is one that could be cleaned, but would not benefit from such treatment - too much of the life and color would be lost. Besides, it really is in very nice condition. Yes, it has its share of lifes little nicks and scrapes, but they only lend to its elegant presence. This clock has received a lot of pre-auction attention while living in our dining room. It just stands out with its elegant simplicity and Roman style. As with all Viennese clocks, the heart of the clock is an exceptionally well made long duration mechanism with maintaining power. The hands, crutch, pulley, all elaborate, highly pierced, and in excellent condition. As is the weight and pendulum bob. And this piece has its original key, which only adds to the originality and charm of this piece. Of course, there is always that one little detail that speaks to me - in this clocks case, the second hand with the beautiful pierced heart to the back of the hand! The dial has 2 or 3 very fine hair-line cracks that would disappear if the dial were cleaned, and both side glasses are wavy and have included bubbles while the door glass appears to be pretty flat, so probably a later replacement. Note too the pendulum rating nut has an inset silvered dial to indicate relative rotation of the nut - you can see the pointer in one of the photo’s for the inset dial. And the beat scale is in excellent, original condition. We have had this clock running in our home for the last couple of months, even though the mechanism would benefit from a cleaning. If you are looking for an elegant reminder of the glory of the Altdeutsche period, you could hardly do better than this piece.